B’nai Jeshurun Congregation is a synagogue that has been serving the Cleveland, Ohio area for almost 150 years. Located in Pepper Pike, Ohio, the synagogue is a large facility that holds several religious, educational and social events throughout the year. 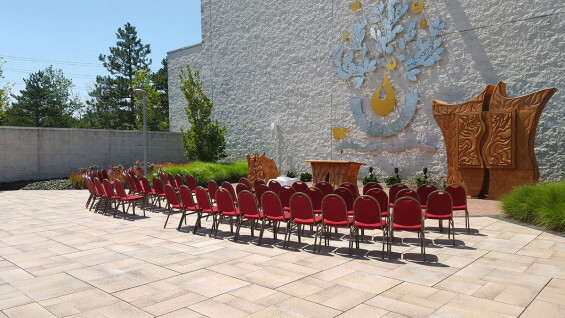 In 2013 the congregation asked landscape architecture firm Cawrse and Associates, Inc. to redesign the synagogue’s auto court and ceremonial courtyard. At that time, the auto court spanned the entire length of the building, which consisted of 40-year old crabapple trees, degraded concrete pavement and corroding concrete bollard lighting. These elements created an unwelcoming space that had not been used by the congregation in decades. 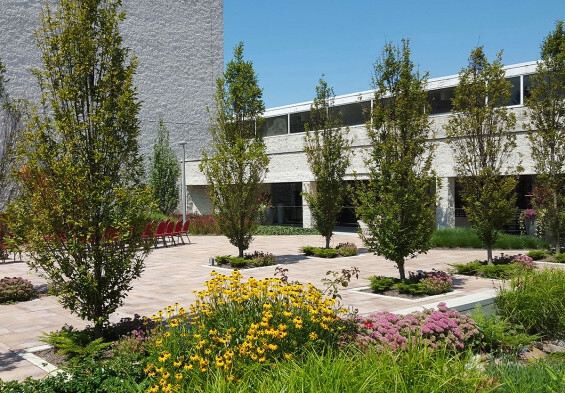 The landscape architect created a design that redefined a designated drop-off and added a new ceremonial courtyard. 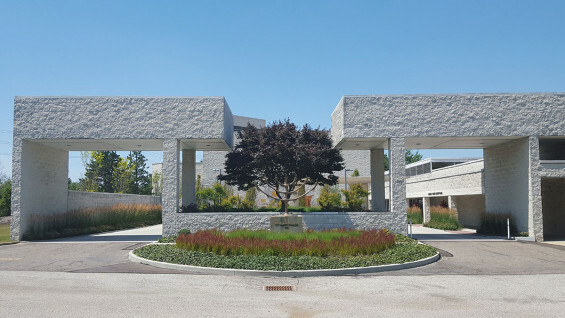 The entrance to the auto court featured a prominent menorah sculpture with a specimen Japanese maple located behind it in a raised planter bed. The menorah sculpture and Japanese maple were saved and new plantings were introduced to the entrance. The length of the new auto court area is much shorter than the former auto court, now tucked-in behind the menorah sculpture and the Japanese maple. This new layout completely separates vehicular traffic from the ceremonial courtyard, which creates a quieter, safer space for events and spiritual reflection. Formerly surrounded by concrete paving, the menorah sculpture is encircled with rings of new plantings; the outermost ring is ‘Catlin’s Giant’ Bugleweed, the middle ring is Japanese Blood Grass and the innermost ring is Hameln Dwarf Fountain Grass. Dwarf Burning Bush, Bugleweed and Japanese Blood Grass are planted against the retaining wall behind the menorah sculpture. 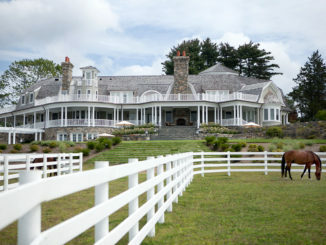 The raised planter containing the Japanese maple had three existing retaining walls rebuilt to correct structural failure due to lack of drainage. The fourth retaining wall was removed and the grade was brought out into the auto court to create a new planting island. Seiryu Laceleaf Japanese Maples, Big Blue Liriope, Snowcap Shasta Daisy and Hameln Dwarf Fountain Grass fill this new planting area. Permeable pavers were also installed along the inside curb of the planting bed to collect stormwater runoff. From the auto court area visitors can see the River Jordan water feature in the foreground of the ceremonial courtyard. 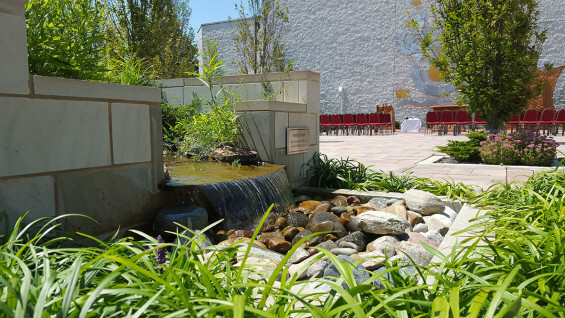 The River Jordan is a raised linear water feature that separates the auto court from the new ceremonial courtyard. Constructed from Amherst Sandstone, the River Jordan symbolizes a rock-edged meandering stream with a cascade at the high end. The River Jordan disappears into a dry riverbed of stone, concealing an underground reservoir and pumping system. 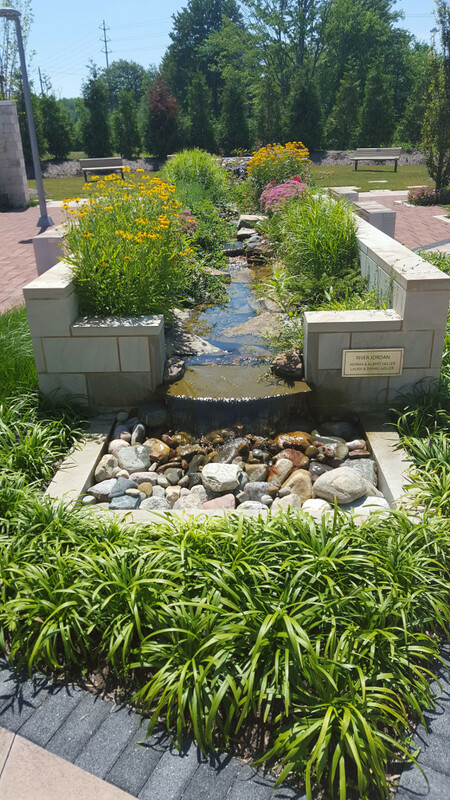 In between native river stone, the River Jordan was planted with multi-seasonal interest plants such as Calgary Carpet Juniper, Black-Eyed Susan, Shrub Roses, Sedums and Dwarf Crested Iris. 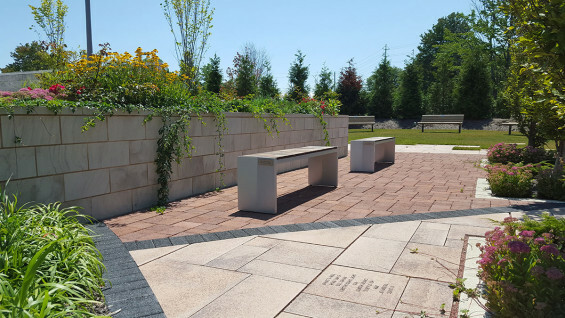 Two benches are placed on either side of the River Jordan, and were selected to provide year-round respite for visitors and members of the congregation. The ceremonial courtyard with a Bima is located on the north side of the River Jordan, along with new tree planting pits containing Frans Fontaine Hornbeam, Juniper, Sedum and Lipstick Strawberry. The Frans Fontaine Hornbeams serve as an upright vertical element in the courtyard and provide visual separation from the auto court. Plants used consistently throughout the ceremonial courtyard are also reflected in the auto court. The Bima is the area that encompasses the podium, the Ark and associated tables. The Ark is a large carved wooden cabinet that holds the temple’s religious scrolls. Hanging above the Bima is an ornate wall-mounted metal sculpture that was retained from the previous auto court. Through the use of permeable paving and planting, the stormwater run-off was reduced by 30% from the former configuration of the auto court. Permeable paving was created by widening the joints in ordinary pavers from 3mm to 10mm, and filling them with color coordinated aggregate. This technique was an inventive characteristic of the design because it drastically improved site drainage while maintaining a seamless paver pattern design, using a paver that was not a traditional “permeable” paver. A split faced concrete wall to the west was opened-up to allow access to a new sculpture garden where future artwork will be displayed. 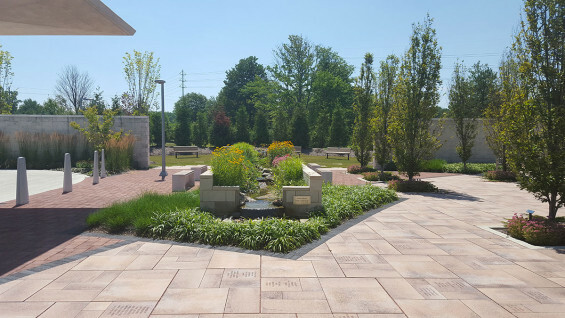 This portion of the ceremonial courtyard pavement fades into the sculpture garden lawn, blending landscape with the hardscape. 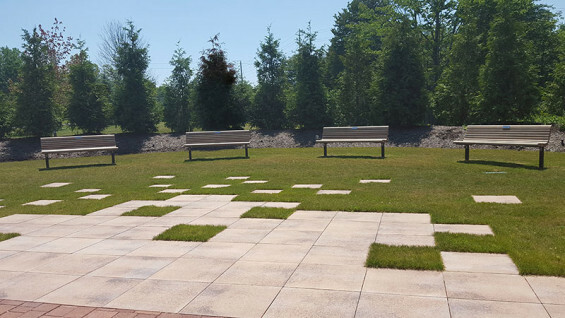 Four benches are placed in the garden lawn to provide a place for contemplation. For privacy, the garden is edged with a low mound and is planted with ‘Green Giant’ Western Arborvitae. Princeton Elms were also planted along the outside of the remaining wall to provide afternoon shade. 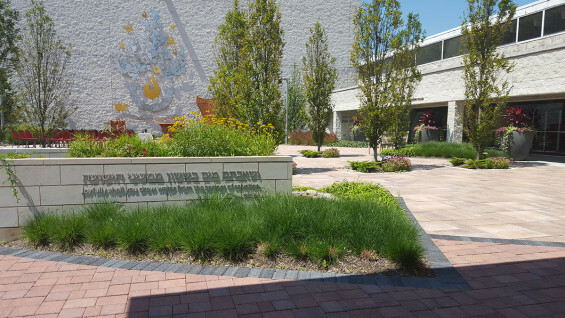 The redesigned ceremonial courtyard is a welcoming, spiritual place that allows for a variety of programs and events. 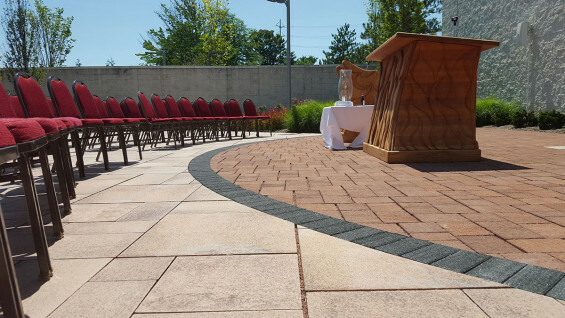 The congregation’s stormwater flooding issues have been eradicated through the use of a permeable paver system that is both functional and elegant.